Written by Parish Clerk on May 24th, 2018 May 24th, 2018 . Having submitted our accounts through an Internal Audit from Auditing Solutions, we now publish the documents below as we submit them to External Audit by LLP Littlejohn. Please note the accounts are available for inspection from 11th June until 20th July (by appointment) from the Clerk. Full details are on the notice below. Written by Parish Clerk on May 3rd, 2018 . Vice Chairman to vacate said post, members invited to submit nominations for the election of Vice-Chairman, Clerk to receive the Vice Chairman Declaration of Acceptance of Office (to be witnessed by the Clerk). There will then follow a Neighbourhood Plan Joint Focus Group Exhibition Saturday 5thMay in Crudwell Village Hall from 11.30am to 2.00pm. You are invited to drop in for an update on progress with the Neighbourhood Plan and the opportunity to express your views on the impact of future development in our community. Written by Parish Clerk on May 3rd, 2018 December 31st, 2018 . This policy explains to councillors, staff and the public about GDPR. Personal data must be processed lawfully, fairly and transparently; collected for specified, explicit and legitimate purposes; be adequate, relevant and limited to what is necessary for processing; be accurate and kept up to date; be kept only for as long as is necessary for processing and be processed in a manner that ensures its security. This policy updates any previous data protection policy and procedures to include the additional requirements of GDPR which apply in the UK from May 2018. The Government have confirmed that despite the UK leaving the EU, GDPR will still be a legal requirement. This policy explains the duties and responsibilities of the council and it identifies the means by which the council will meet its obligations. GDPR requires that everyone within the council must understand the implications of GDPR and that roles and duties must be assigned. The Council is the data controller and Peter Gilchriest (Chairman) is the Data Protection Officer (DPO). It is the DPO’s duty to undertake an information audit and to manage the information collected by the council, the issuing of privacy statements, dealing with requests and complaints raised and also the safe disposal of information. GDPR requires continued care by everyone within the council, councillors and staff, in the sharing of information about individuals, whether as a hard copy or electronically. A breach of the regulations could result in the council facing a fine from the Information Commissioner’s Office (ICO) for the breach itself and also to compensate the individual(s) who could be adversely affected. Therefore, the handling of information is seen as medium risk to the council (both financially and reputationally) and one which must be included in the Risk Management Policy of the council. Such risk can be minimised by undertaking an information audit, issuing privacy statements, maintaining privacy impact assessments (an audit of potential data protection risks with new projects), minimising who holds data protected information and the council undertaking training in data protection awareness. One of the duties assigned to the DPO is the investigation of any breaches. Personal data breaches should be reported to the DPO for investigation. The DPO will conduct this with the support of the Parish Council. Investigations must be undertaken within one month of the report of a breach. Procedures are in place to detect, report and investigate a personal data breach. The ICO will be advised of a breach (within 3 days) where it is likely to result in a risk to the rights and freedoms of individuals – if, for example, it could result in discrimination, damage to reputation, financial loss, loss of confidentiality, or any other significant economic or social disadvantage. Where a breach is likely to result in a high risk to the rights and freedoms of individuals, the DPO will also have to notify those concerned directly. It is unacceptable for non-authorised users to access IT using employees’ log-in passwords or to use equipment while logged on. It is unacceptable for employees, volunteers and members to use IT in any way that may cause problems for the Council, for example the discussion of internal council matters on social media sites could result in reputational damage for the Council and to individuals. Being transparent and providing accessible information to individuals about how the Council uses personal data is a key element of the Data Protection Act 1998 (DPA) and the EU General Data Protection Regulation (GDPR). The most common way to provide this information is in a privacy notice. This is a notice to inform individuals about what a council does with their personal information. A privacy notice will contain the name and contact details of the data controller and Data Protection Officer, the purpose for which the information is to be used and the length of time for its use. It should be written clearly and should advise the individual that they can, at any time, withdraw their agreement for the use of this information. Issuing of a privacy notice must be detailed on the Information Audit kept by the council. The council will adopt a privacy notice to use, although some changes could be needed depending on the situation, for example where children are involved. All privacy notices must be verifiable. The DPO must undertake an information audit which details the personal data held, where it came from, the purpose for holding that information and with whom the council will share that information. This will include information held electronically or as a hard copy. Information held could change from year to year with different activities, and so the information audit will be reviewed at least annually or when the council undertakes a new activity. The information audit review should be conducted ahead of the review of this policy and the reviews should be minuted. The two enhancements of GDPR are that individuals now have a right to have their personal data erased (sometime known as the ‘right to be forgotten’) where their personal data is no longer necessary in relation to the purpose for which it was originally collected and data portability must be done free of charge. Data portability refers to the ability to move, copy or transfer data easily between different computers. If a request is received to delete information, then the DPO must respond to this request within a month. The DPO has the delegated authority from the Council to delete information. If a request is considered to be manifestly unfounded then the request could be refused or a charge may apply. The charge will be as detailed in the Council’s Freedom of Information Publication Scheme. The Parish Council will be informed of such requests. There is special protection for the personal data of a child. The age when a child can give their own consent is 13. If the council requires consent from young people under 13, the council must obtain a parent or guardian’s consent in order to process the personal data lawfully. Consent forms for children age 13 plus, must be written in language that they will understand. The Council must be registered with the ICO. Our registration number is ZA 181726. A copy of this policy will be available on the Council’s website. The policy will be considered as a core policy for the Council. An information audit will be conducted and reviewed at least annually or when projects and services change. Privacy notices must be issued. Data Protection will be included on the Council’s Risk Management Policy. The Parish Council will manage the process. This policy document is written with current information and advice. It will be reviewed at least annually or when further advice is issued by the ICO. All employees, volunteers and councillors are expected to comply with this policy at all times to protect privacy, confidentiality and the interests of the Council. Written by Parish Clerk on May 2nd, 2018 April 7th, 2019 . Written by Parish Clerk on March 7th, 2018 March 7th, 2018 . 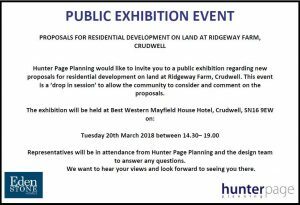 There are two meetings in the near future, the Crudwell Neighbourhood Plan invites residents to come along and find out about how the project is progressing; there is an information exhibition about proposals at Ridgway Farm. Written by Parish Clerk on February 13th, 2018 February 13th, 2018 .
muck in for a few hours. It is a 10am start, meet at Crudwell Village Hall car park , and if you can help until lunch time (12.00 noon) that will be great! All welcome, you may wish to bring your own protective gloves if you have them to hand! Written by Parish Clerk on January 3rd, 2018 January 3rd, 2018 . The policing precept consultation which launches today (2/1/2018) is looking for the views of Wiltshire residents on the proposed increase of £12 a year. Currently the average band D household contributes £14.19 per month to local policing, but if residents back the proposal then this would rise to £15.19 per month. As a Force, Wiltshire Police has seen the second highest increase in demand across the country in the last year yet the funding we receive from central government doesn’t recognise the increasing pressures our service is under. In fact we receive the fourth lowest funding per head of population in England and Wales. Since 2010, Wiltshire Police has received £19 million less but have been responding to more crimes and supporting more members of the public year on year. Whilst we live in an incredibly safe county, there’s only so far the budget will stretch and we’re streamlining our services to ensure they’re as efficient as possible at the same time as keeping the public safe, but we are feeling the squeeze more than ever. Without this increase Wiltshire Police will have to look at further reductions in officers and staff to close a budget gap of around £3m. That’s why I am asking whether residents in Wiltshire and Swindon would be prepared to pay an extra £1 a month to help bridge this gap. This increase will mean that I can protect frontline services from further reductions and maintain the current level of service. The consultation which runs from 2nd January 2018 to midday 31st January 2018 wants to hear your views on the proposed increase. For more information on how to share your views please visit www.wiltshire-pcc.gov.uk, you can also email pcc@wiltshire.pcc.pnn.gov.uk or use #AskAngusPCC on social media. We are pleased to announce Simon Grainger was Co-Opted as Councillor at the January 2018 Parish Council meeting. We look forward to working with Cllr Grainger, this brings us to our full complement of 9 Parish Councillors. Written by Parish Clerk on December 12th, 2017 December 12th, 2017 . Dear Parishioners, YOUR PARISH NEEDS YOU! As you will all be aware, the Parish Council (PC) together with the Neighbourhood Plan (NP) Steering Committee (SC) are facilitating the production of a NP for Crudwell Parish. Once adopted or ‘made’ the vision for how our community develops over time as set out in the NP becomes the blue print against which all planning applications will judged, to ensure they address the priorities of our area. It has to be written with the full engagement of the local community. Without full engagement, it will carry light weight. By getting comment cards in before the 22nd December. Nearly 1,000 leaflets were personally delivered to Residents, Local business/employers, Parents at School / Pre-school and other Stakeholders in Crudwell Parish 3-4 weeks ago. To date we have received just 20 comment cards so please complete as soon as possible. By giving permission to add your e-mail addresses to the NP e-mail list, so that we can keep you informed and invite you to the policy workshops / focus groups we will be running early in the New Year. 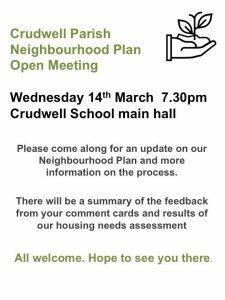 Your contact details will remain confidential and will only be used to keep you updated on the Crudwell Neighbourhood Plan. We had over 250 Parishioners signed up on the Crudwell Voice distribution list, we would love for all of you to agree to that information being transferred to the NP e-mail list. If you are able to offer a bit more time to the NP process, we would be hugely grateful so please do let us know if you can and wil contact you to discuss options. Spread the word! Talk to local friends, family, neighbours and employers about it and urge them to get comment cards in. Without a NP in place, we are wide open to speculative development so PLEASE ACT NOW AND COMPLETE THE COMMENTS CARD. We will not be successful in getting a NP unless we can demonstrate local community engagement at every stage! Copyright Â© 2017 Crudwell Voice Community Representation, All rights reserved. You are receiving this email because you gave your email address to one of the steering group or a friend suggested you might be interested. Our mailing address is: c/o Sian Burke-Murphy Crudwell Voice Community Representation Tetbury Lane Crudwell Malmesbury, Wiltshire SN16 9HB United Kingdom Add us to your address book Want to change how you receive these emails? You can update your preferences or unsubscribe from this list.